Dhaka, Bangladesh (BBN)– Bangladesh Finance Minister AMA Muhith placed BDT 2.95 trillion (US$37.93 billion) “mega” budget outlays for the fiscal year (FY) 2015-16 at the National Parliament of Bangladesh on Thursday aiming to transform the country into a land of prosperity. The original budget for the outgoing fiscal year was BDT 2.50 trillion which was later revised to BDT 2.40 trillion. 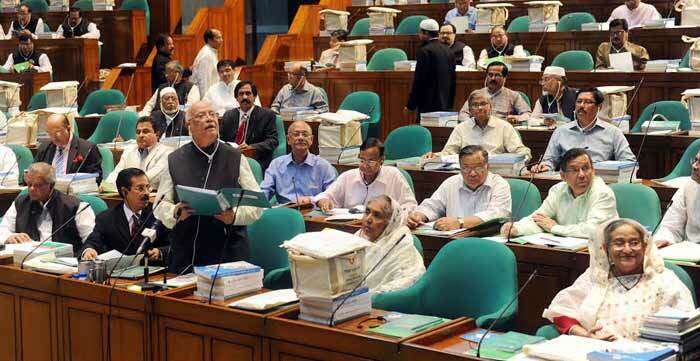 Wearing his favourite pajama and panjabi with a ‘Mujib Coat’, Mr. Muhith started delivering his 135-page Budget Speech in parliament through power-point presentation from 3:30 pm (local time) for nearly five hours in presence of the ruling and opposition party MPs. Under the proposed budget, the revenue receipts have been estimated at BDT 2.08 trillion which is 12.1 per cent of GDP, of which National Board of Revenue (NBR) tax revenue is estimated at BDT 1.76 billion that is 10.3 per cent of GDP. The finance minister believes this revenue target is achievable given the comprehensive reforms implemented in NBR tax collection potentials and stability in economic environment. Total expenditure has been estimated at BDT 2.95 trillion, which is 17.2 percent of GDP. Taking Annual Development Programme (ADP) allocation for autonomous bodies to the tune of BDT 39.96 billion into account, the size of the total budget will stand at almost BDT 2.95 trillion. 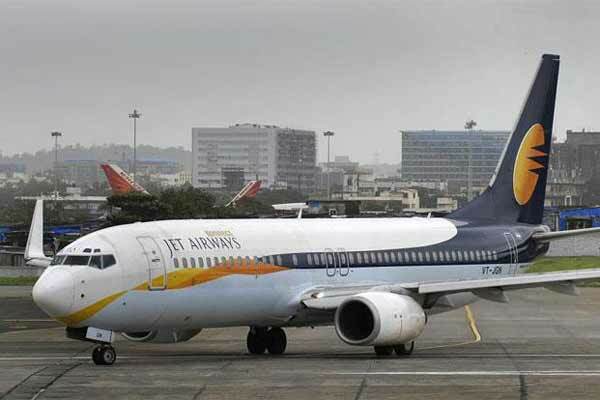 The allocation for non-development expenditure, including other expenses, has been estimated at BDT 1.98 trillion, which is 11.5 per cent of GDP. In addition, BDT 970 billion has been estimated for ADP. The overall, budget deficit will be BDT 866.57 billion which is 5.0 per cent of GDP, of which, BDT 301.34 billion that is 1.8 per cent of GDP will be financed from the external sources and BDT 565.23 billion, which is 3.3 per cent of GDP, from the domestic sources. Of the domestic financing, BDT 385.23 billion will come from the banking system and BDT 180 billion from savings certificate and other non-banking sources, according to the budget document. “If we can increase disbursement from the huge pipeline of foreign assistance, we will be able to reduce our dependence on domestic borrowing. We will continue our efforts to this end so that foreign aid utilization rate increases in the next year,” the finance minister explained. The minister also proposed to reduce the corporate tax, except cigarette manufacturing companies, aiming to assist the country’s capital market. He proposed to decrease tax rate from 42.5 per cent to 40 per cent for publicly traded bank, insurance and financial institutions. Mr. Muhith also proposed to decrease tax rate from 27.5 per cent to 25 per cent for publicly traded companies. In an attempt to increase the number of taxpayers, the minister said the target is to raise the number of active taxpayers to 3.0 million by the end of the tenure of this government in 2018-19. The Finance Minister said that in continuation of the ‘Vision 2021’, in this tenure, the government would present before the nation its ‘Vision 2041’, which will transform Bangladesh into a land of peace, happiness and prosperity by 2041. Mr. Muhith placed the second budget of the present Awami League-led government since the general election took place in January 2014 in the parliament. 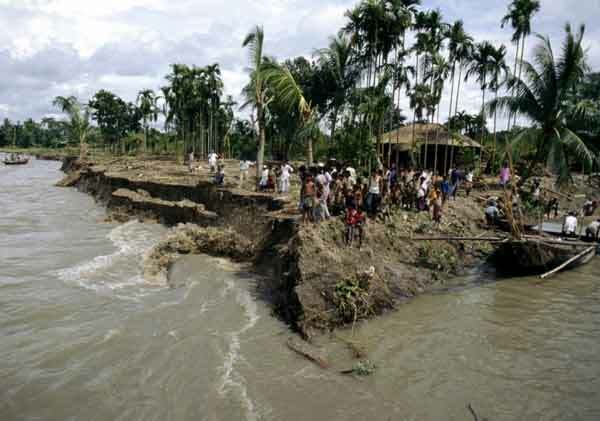 It was the 16th budget of the Awami League in its four terms of governance since the independence of Bangladesh. Earlier in the afternoon, the cabinet at its special meeting approved the budget with Prime Minister Sheikh Hasina in the chair at the National Parliament.